I love these muffins for so many reasons. Not only do they taste fabulous, but they are low carbohydrate, have a low glycemic index, no sugar, and are surprisingly very filling. 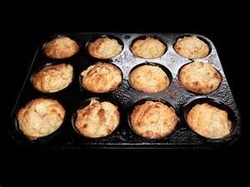 These muffins are great for a snack. I make a big batch and freeze them then defrost as I need them. 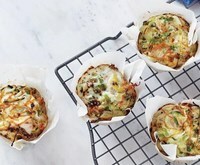 Forget store bought egg muffins (yeah, you know which ones I'm talking about). These have healthy ingredients, taste great, and are easy to make and very forgiving. You can use whatever ingredients you have on hand. You don't have to stick to what's in this recipe. Quinoa for breakfast? Why not? 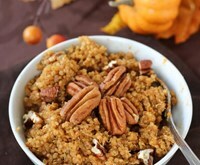 Quinoa is a great gluten free grain and also is a complete protein, which is uncommon for most grains. If I'm going to make up a batch of quinoa for dinner or lunch, I just make extra to make a quick breakfast or I just pack it up to go so I can have it as my mid morning snack at work. Yum!